Become A Friend Of Cranleigh Rotary - And Change Your Life! The World`s Biggest Coffee Morning! Rotary Quiz is a Hit! Rotarian Andy Completes Second Marathon! 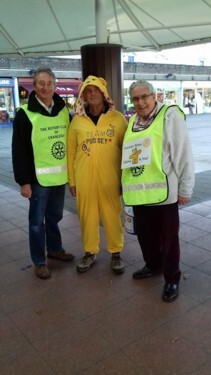 Cranleigh Rotarians Are Good Sports! 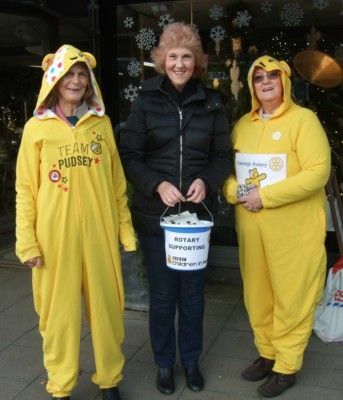 Cranleigh Rotarians enjoyed a cool, sunny afternoon collecting for Children In Need on 18 November. 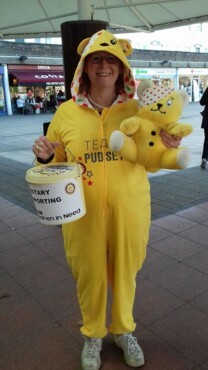 Several Rotarians were particularly noticeable in their bright yellow Pudsey costumes (see photos) and once again, members of the public were very generous in supporting this wonderful cause. The collection and raffle of a Pudsey Bear raised a splendid total of £617. We are most grateful to everyone who donated so generously in the lead up to Christmas.